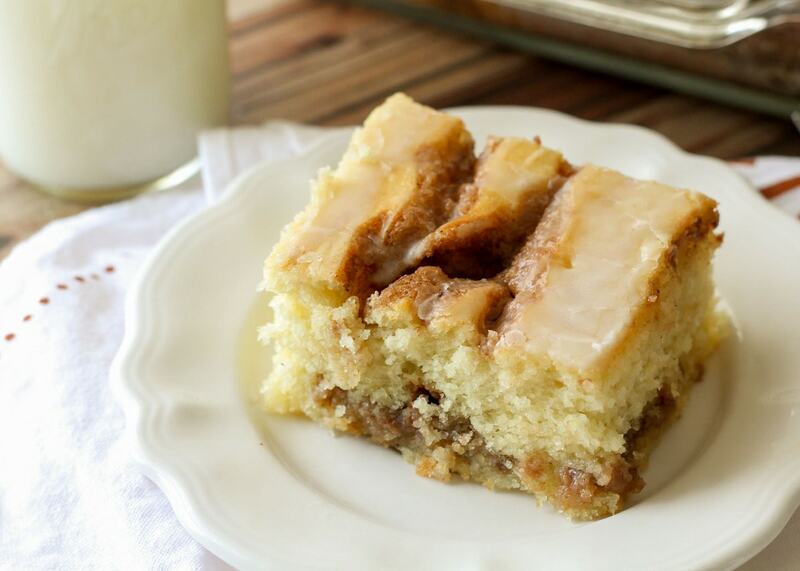 This cinnamon roll cake is simple and takes your favorite roll and puts it in cake form. 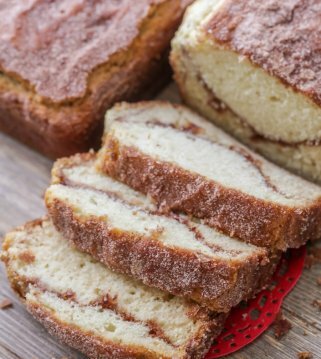 Swirled with cinnamon, butter and brown sugar and topped with a glaze, this cake is sure to be a new favorite. This next breakfast recipe is a family favorite. Imagine a Cinnamon Roll in cake form. I can tell you right now that it is AMAZING! 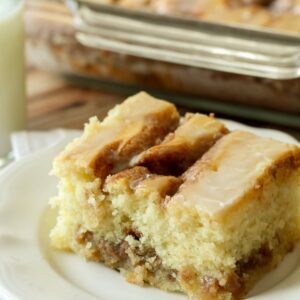 That’s what today’s cinnamon roll cake is – a simple and delicious cake that tastes like a cinnamon roll. It’s pretty much a family favorite and has become a favorite, just like our easy coffee cake recipe. Today’s cinnamon cake recipe is seriously so gooey and delicious. We have made it so many times that it has become a holiday morning must-have. If you love the idea of a cake version of cinnamon rolls, then you have to try this recipe. Making this cake is simple!! Yes – there is lots of butter, but that’s what it is so stinking delicious! To make this cinnamon casserole, begin by mixing the flour, salt, sugar, baking powder, milk, eggs and vanilla together. From there, stir in the melted butter and pour into a greased 9×13 pan. Then you will mix your cinnamon topping ingredients together and drop over the cake. Swirl your topping and cake mixture with a knife going up and down the length of the pan (only inserting the knife a little). Bake at 350 for about 30 minutes. While baking, make your glaze and drizzle over the warm cake. 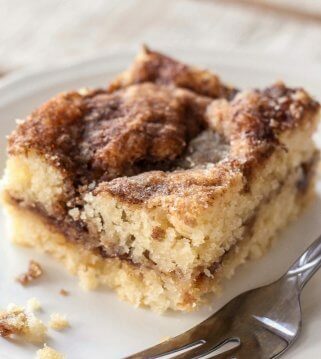 And don’t say we didn’t warn you that this cinnamon cake is seriously so delicious and addicting! We love making this fresh, so it’s warm, but you can make this ahead of time if needed. Just reheat in the oven for a few minutes to get warm before frosting so it melts right into the cake. You can store the cake for up to 24 hours in advance by covering with foil or saran wrap and leaving on counter before reheating. Can you freeze cinnamon roll cake? Yes, you can freeze cinnamon roll cake. Just cover tightly in foil and keep in freezer for up to 3 months. You can reheat in the microwave or on a low temp in the oven. Can you make cream cheese frosting for cinnamon roll cake? Of course, you can. This recipe is more of a glaze, but you can definitely make a cream cheese frosting instead. We love the cream cheese frosting we use on our one hour cinnamon rolls. For that recipe, CLICK HERE. I recommend serving this yummy treat when it’s warm because it just melts in your mouth and tastes just like regular Cinnamon Rolls! We love this cinnamon cake so much that we have it for Christmas every year. It’s just SO good!! Stir in melted butter, slowly. Pour into greased 9x13 pan. Swirl your topping and cake mixture with a knife going up and down the length of the pan (but only inserting it in the cake mix a little - not all the way). Mix glaze ingredients together. Drizzle over the cake while it's still warm. ENJOY! LOL..that’s what I love to hear! Thank you so much! I love how easy this is! It looks incredible! My mom and I have been trying to figure out how to make gluten free cinnamon roles. The results have not been fabulous. Gluten free dough is really sticky and difficult to roll out. Adapting this recipe would be so easy! Thanks so much for the idea! Pinning. What will you use in place of the flour to make this gluten free? King Arthur makes a gluten free flour that you can Substitute in any Recipe. Yummy!!! I love a little behind the scenes! This looks o seriously YuMMy! I love my moms cinnamon rolls, I took a bunch of them to my faculty Christmas thing and all 4 trays were eaten with in 2 hours! It was AWESOME! I am so going to try this for breakfast in the morning! Thanks for sharing! Mine is in the oven now for 32 min and I went to check it and it was jiggly. I’m sure it depends on the oven and I may have used a smaller pan. Hope they are still as delicious as it looks and sounds!! Oops I replied to the wrong post! Meant to reply to KYP. mine is baking right now and already the baking time is way past due! I’m watching it to see how long it takes……but already the time is close to 50 minutes. I’m using a disposable 9×13 alluminum…..don’t usually use this type but saving clean up dishes for Easter prep. I doubled the recipe, just removed it from the oven. It took me 55m. Looks sooo good! I’ve made homemade cinnamon rolls before and they take forever…this looks yummy, fast and easy! I’m pinning it. Do you have any idea if you could mix it up the night before and put it in the fridge? Thanks! I wish this was breakfast tomorrow. Heck, I wish it was dessert right now! Made this for a girl’s night. Everyone loved it!! So glad everyone loved it! It’s definitely a family fav of ours. Thanks for stopping by! Can you use 1% milk or coconut milk for this recipe? Ooo… my oldest requests cinnamon rolls every single time I ask what he wants for breakfast and I usually have to say there’s not enough time. I can’t wait to surprise him with this. Thanks!! Yum! 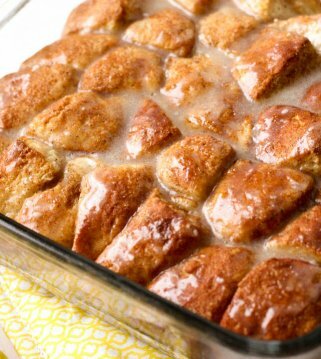 I love cinnamon anything=) Can’t wait to make this! Cat Can Cook. It is the best no fail muffin recipe. Try it out. you wont try anything else !!!! My husband asked if I could make something for his work brunch tomorrow. Um, I think his co-workers will just LOVE this!!! Verdict is in…….This is sinfully delicious!!!! Some of the co-workers had 3 pieces!!! My hubby was able to bring home some for myself and our boys! I will make this again!!!! Just made this but I had to bake it 10-15 minutes longer. Did anyone else have this problem? It tastes great and I will make it again. I’m wondering if you “over swirled” the brown sugar mix like I did? I ended up having to cook longer. I had the same issue with the length in baking time! But it smells sooo good! Same issue for me. I did swirl the brown sugar mix a bit more but at 35 min it was still jiggly. Added 15min to baking time so I hope that does the trick! Do u use plain flour or self rising flour. I couldn’t wait to try this recipe. I’ve always enjoyed eating but disliked making cinnamon rolls, so this was very appealing alternative. I had pretty good results but it was too sweet for me. I think I’ll try to reduce the sugar and see how it turns out. I’m going to try to cut the butter in half also. My globs of cinnamon were probably too big so I will make them smaller. I think this is a great recipe pretty simple just for me needs a few tweaks. When I get it down pat I’m going to try to incorporate maple into the recipe. Thanks for sharing! Well, I let it cook longer because I did reduce the temp to 325 at about halfway and probably shouldn’t have. It’s for hubby’s birthday, so we haven’t cut into it, but I can tell you it doesn’t look like yours, lol! I’ll make a note to use the 350 all the way through, thanks. Just made this but it didn’t work at all.. The butter just went to the bottom and it was just soaked in butter and soggy. 🙁 Really bummed, it smells good though. Alyssa, I have made this recipe many times and it always turns out wonderful. Go over your ingredients again. Did you use 3 cups of all purpose flour? 4 tsp baking powder, not soda. Take your time making this, it’s well worth the effort. I am 75 years old; we have company often and this is always for breakfast, along with fresh fruit. People ask me to make this all the time. One is in the oven right now and I’m making another for the freezer. (Cut in half, wrap in foil, then slip in freezer bag. Lasts a couple of months). Don’t give up on this recipe, it’s a keeper. I made this yesterday. Same thing happened to mine. Too gummy and tasted the flour above everything else. I also baked it longer as it was so jiggly. Just made this!! Very tasty!! I halved the recipe because with the two of us we didn’t need all of it. I will make again. What size pan did you use when you “halved” the recipe? Thanks. Recently, I saw a recipe for putting tortilla wraps in a muffin tin, and topping them with chicken and cheese. Did I see that recipe here? My computer was down and I wasn’t able to print it. I love your site! do not waste 3/4 a pound of butter on this cake. It is awful. I so love when I get a craving for something sweet and I have all the ingredients in the kitchen without having to go out. This cake is an absolute HIT!!! This cake is a new family favourite in my house too! Thank you so much for sharing the recipe. I hope you won’t mind me sharing a Britished-up version (weights rather than cups) on my blog. I will of course link back to your original recipe. I hope you can, as I know that US and UK measures can vary. Also, I’m not well acquainted with the old imperial measures. Since I saw these on Pinterest a couple of weeks ago, they have been on my mind! I have made cinnamon rolls once since being married, but the amount of work was a bit daunting (especially since I’m not a morning person!). This is such a fabulous idea! I’m making these this afternoon for a mom’s group tomorrow- thanks so much for the idea! I am currently on the fence. I just cut thru this and anywhere there was the brown part it’s soggy as… And so as soon as I am done, I am going to throw it back in the oven and hope for the best, but I can honestly see myself throwing this in the garbage or eating around the brown. I am wondering if this much butter is necessary? It seems excessive somehow and I can’t understand why the white is cooked and the brown is nearly ruining the cake. Of course it tastes good, but I probably shouldn’t have tried it with it being so gooey. Sigh. You definitely don’t want to over swirl. If you do, like I did, you will have to add on some extra time. Still yummy and would make again. Thanks for the great recipe.. I am making this right now. However, I added an additional 10 minutes and it still isn’t done. Has this happened to anyone else? Thank you! Yes I did and I cooked it for about 48 minutes and it is awesome!I guess I over swirled it but it came out great. OH MY GOD!!! This is sooooo DELICIOUS!!! my mom and grandma loved it and i know everyone else too!! Thank you so much, it’s so easy to make and it tastes great! This looks easy enough to make. Will give it a try and pinning it. 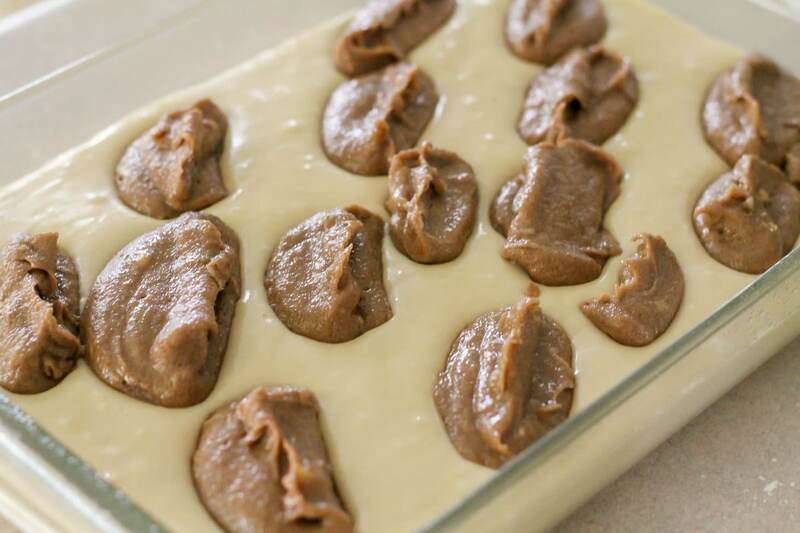 I tried it with margarine and didn’t like it that much…. Did it twice in 4 days…… Enough said hahaha. Everyone LOVES IT! I took it out of the oven 2 hours ago and im afraid its not gonna last through the night! Great recipe! A billion stars!!! Getting ready to make this today. Questions: 1) reading comments, so me are saying “don’t over swirl” what does that mean?? 2) in measuring flour I typically use a spoon to scoop the floor into a measuring cup – should I do same for this recipe or do you just put your measuring cup straight in a scoop up – I think it makes a slight diff ?? Has anyone tried cutting back on the sugar and buttuer? If so, what amounts did you use? Thanks – this is worth trying for sure since I LOVE cinnamon rolls! Will post when its all done! So I made the cake and it is VERY good! Perfect with a hot cup of coffee. I made a couple of mistakes – 1) of adding one too many Tablespoons of cinnamon, but really, I love cinnamon so it was a good mistake (lol) and 2) I didn’t measure the powdered sugar – tried eyeballing the two cups, but clearly it wasn’t enough. The glaze wasn’t thick enough like your photo but i think its still amazing. My family loved it, but it took almost 20 extra minutes to cook through. It’s very sweet and rich. If a recipe calls for baking powder and salt then the flour is all purpose. Self rising already has those ingredients in it.. If you’d like to substitute self rising for all purpose omit the baking powder and salt. hi… i made this cake because it looked really good in the pics its still in the oven cant wait to eat it but it does take along time in the oven and because of the brown sugar it is really brown on the top i guess its my first time but to get it perfect i will make it again thanks! I made this for a friend’s birthday and doubled for our family to try! My kids had a nice treat when they got home from school. They loved it so much that they asked for more and wanted to call that dinner. Thank you. Sounds so good. I’m not even sure how I came across your blog and this recipe, but my Sunday brunch crew thanks you! It took just a few minutes to put together and was absolutely amazing. I’d recommend this recipe for a brunch potluck or for a family get-together on a holiday morning. I’m really loving the theme/design of your weblog. Do you ever run into any browser compatibility issues? A small number of my blog audience have complained about my website not operating correctly in Explorer but looks great in Safari. Do you have any ideas to help fix this issue? I seemed to have a problem with the end product being underdone as well. It tasty good, but gooey. Is that supposed to be the end result? I’ve made this several times and it has always had a coffee cake consistency. I would bake it a little longer. Sorry about that. Hi, just wanted to say happened upon your site by chance but love the look and many recipes as well. The only thing I would request is (a) offer a larger font size for print purposes and (b) in your recipes page change your font colour to something darker in order to be able to see it as the contrast is pretty light and also very small font size. Other than that I love your site .Thank you so much, I’ll be back again. OMG!!!! its 9:42 at night, and im thinking about cancelling my nightlife plans to go to the store pick up what i need to make these. I would LOVE to have this with my coffee in the morning. Made it this morning… OMG again! Yummy!! This cake is amazing! My kids and husband loved it. Will be making again for sure.Thank you for the wonderful recipe. Another good recipe. Thank you, Kristyn. Thanks for the nice recipe. Have a great week. I have made this and it was delicious. However, my questions is can you make this in a smaller size pan? This is literally the best cinnamon bun cake I have ever had. I have made this about 3 times now and everyone I serve it to thinks it is absolutely delicious and so do I. I just wish it wasn’t so bad for you lol! I’m right there with you, Calindy!! SO good but NOT so good for you. I’m making it today, though. 😉 Whoops! Made this tonight & omg it is so good!!! I did have to cook about 10 minutes longer & it could have bern over stirring with the knife but otherwise best cake!! So moist & so yummy!! Thank you!! This recipe is divine! The cake is so soft and buttery and with just the perfect amount of cinnamon! I cannot thank you enough for the recipe! I added a few tablespoons of cream cheese to the frosting for an added bonus flavor! Yum! Yay! So glad you like it. And you definitely can’t go wrong adding some cream cheese – YUM!! Looks so good! What size pan and is glass better than a metal pan? Oh, my goodness!! I baked this late this morning. I ate this for lunch instead of the gumbo I prepared for today. My taste buds were excited – cake and cinnamon rolls all in one!!!! After reading the reviews the other night, I was a little concerned about over swirling and too much butter. Everything came out perfect! I didn’t have any problems. My family enjoyed it. Thanks for the recipe. I’m so glad it turned out perfect. We made it this week too and I couldn’t stop eating it – it is seriously SOOO addictive! so! today Im going to try this as cupcakes. This recipe is to die for good!! I had it over the weekend at a friends house, so of course I had to make it for my family today. I’m making this right now! Can’t wait to serve it tonight after dinner! I have made this twice. I used the ingredients as written and baked it exactly 32 minutes, as directed. It was perfect. We love it. I believe the trick is in the swirling method. I let the knife only sink about an inch in the batter, so that the topping stays mostly on top. When checking for doneness, I inserted the toothpick in a place where there is only cake, without topping. I am cooking for two, so there was a lot. I froze individual servings for breakfasts later. It freezes well. Thank you for this amazing recipe. You’re welcome, Leslie! This is one of our favorites too. 🙂 Thx for stopping by! I took this to a church potluck and had tons of requests for the recipe! Thanks for sharing it! Wow, nice job on those swirls. I would probably mess them up but somehow, I don’t think it would matter. Beautiful work overall! Oh my goodness!!! This is wonderful! Made this for breakfast this morning and it was delicious! Thank you so much for all of the wonderful recipes. Love your website! Definitely going to try this but with cream cheese frosting! Ooooh – That would be great too!! Can you please clarify the amount of butter used in this recipe. Butter is listed twice – 1/2 cup and 3/4 cup. I assume the 1/2 cup is used in the cake and the 3/4 cup is to be put in the topping………but then in the instructions you say add 1 cup butter to topping ingredients………can you please clarify this for me. It looks delicious and I want to make it for a new neighbor that will be moving across the street from me soon. Appreciate a quick response! Thanks! Thanks Kristyn for the quick response and clarification…………I look forward to making this next week for my new neighbor………..I love your site……..all your recipes look amazing!! I made this today and used too much butter in the batter. The directions were not very clear. I have some butter sitting around the edges so we’ll see if it soaks in. Is it really 4 tsp baking powder? Just want to make sure. Thanks. Looks delicious! I just wanted to take a minute to comment. First, thank you for sharing the recipe. It looks amazing. However, I was shocked at how sweet it is. If I make this again, I will probably cut the sugar in half across the board. (For the swirl, I will probably cut the entire batch in half). Some of my family (2 adults and 4 kids) wouldn’t even eat it. I also had to leave it in for longer (I don’t think I over-swirled), but that wasn’t a big issue. Seriously, thank you for sharing. I hope I can try again and make it work for us. 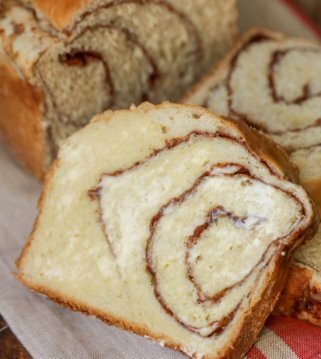 Quick question: if there is no cinnamon in the batter and the swirl does not go far into the bread, how can I get yummy cinnamon towards the bottom (like the picture)? Thanks! I tired this recipe and it was awesome …..it tasted so good!!!!! thanks for posting . I love this cake. i made it and now my entire family thinks I can cook/bake. I made this on wed and by wed night i had three family members requesting that i make them one ASAP. Thank you soooooo much for this recipe. I just made this recipe……. uhm, I really don’t have words to express how I feel, maybe OMG sums it up! 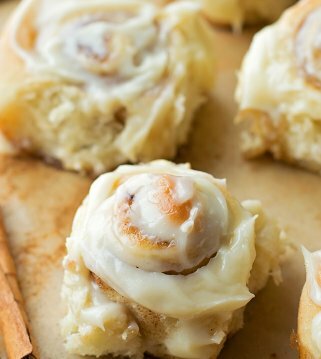 I’ve never made cinnamon rolls but I have plenty of recipes pinned because, well, I LOVE THEM! My best friend makes homemade cinnamon rolls, as far as I know they are the only homemade ones I’ve ever had and they are to die for. There is one problem with me making her recipe, no matter how much free time I have I DON’T have the patience or the process, I mean make dough then wait and let it rise and something about an 4 or 8hr process… LOL, yeah right! So I stumbled upon your recipe here yesterday. I had to make it today! It’s a TOTAL & COMPLETE HIT with the entire 4 of us! OMG it’s to die for. Now that I’ve made this I am not sure I will ever attempt the longing process of real cinnamon rolls! Your comment totally made my day! I, too, have never tried the long process of cinnamon rolls but my mom does it all the time. 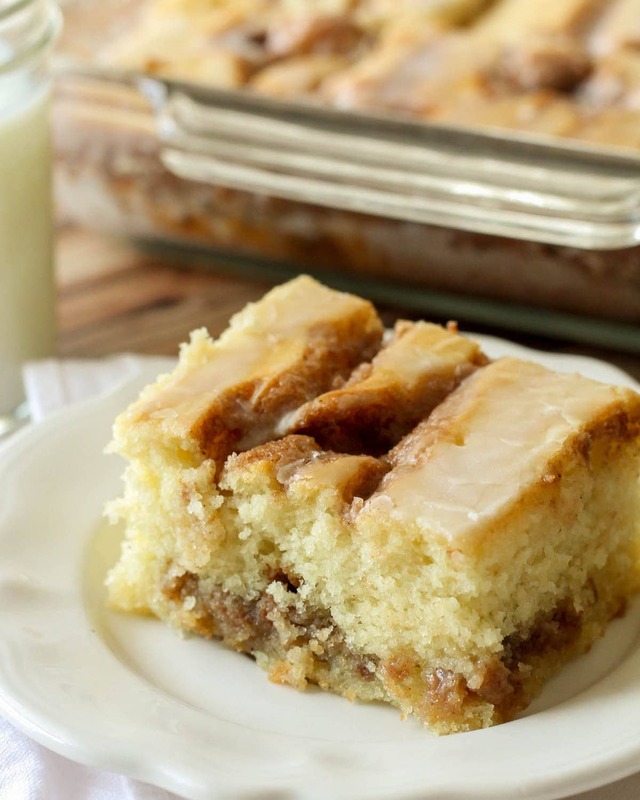 We LOVE this Cinnamon Roll Cake recipe and make it all the time, though. It’s our favorite and WAY simple. If you like this then you must also try these Cinnamon Roll Bites – https://lilluna.com/cinnamon-roll-bites/. They are delicious!! ooooh, bite sized pieces :O well I will definitely be making this one next, there are only 3 pieces left of this cake so it won’t be long before the bites hit the oven :P… I will let you know on that recipe how it goes 🙂 Btw, I LOVE you read all your replies! LOL. I try to read them all, but I do miss a few every once in a while. Let me know what you think of the Cinnamon Bites. They are SOOO good and really quick to make. 😉 Merry Christmas!! My mom and I have been trying to figure out how to make gluten free cinnamon roles. The results have not been fabulous. We made this today and it was delicious. We added cinamon 1 tbsp to the icing and the kids raved about the extra flavor. Thanks for sharing. I made this cake and used too much butter in the batter. The ingredient list make it a little confusing. We’ll see how it turns out. Smells good! Hi, is swans down cake flour or all purpose flour ? Ok thanks but iis it ok ti use the cake flour I don’t have any regular flour? This recipe looks soo good I’m excited to make it! But I was wondering how much butter was melted in grams? anyone have any idea whether I could use self-raising flour and forgo the baking powder? Tried this morning and it tasted great! The only thing is the cake batter turned out a bit thick. Also the cinnamon brown sugar mixture stayed on top instead of mixed inside the cake. How do you get the cake batter to be more of a fluid consistency, and how does the brown sugar mixture get to the bottom and middle of the cake? Hi I live in Glasgow, Scotland and I am looking forward to making this yummy cake however I am not sure about the flour you use? You say flour would I be right in saying that this is plain flour as we know it because you are using baking powder? My hubbies favorite dessert is cinnamon rolls but I am definitely not the cinnamon roll making time. But when I found this recipe I knew I had to make it for him. He was at work and told me he was craving cinnamon rolls so I whipped this up and had it for dessert for him. He said it is better than regular cinnamon rolls cause he likes the thickness of the cake, or as he calls it, the meat part of the cake lol. So if you are looking for an alternative to making cinnamon rolls, you should try this. I followed the recipe to a “t” and it came out perfect. I made this Saturday and it is amzaing! We love it. So much easier than making rolls. Thank you so much! It’s definitely easier than normal Cinnamon Rolls. So glad you liked it!! Thanks for stopping by! I pinned this two years ago and haven’t made it yet. I just made this to bring for work tomorrow. Followed the directions exactly and it turned out absolutely amazing!!! Thank you for a cinnamon rolls recipe, without all the work of cinnamon rolls! Just made this (its 11 pm)! We are snowed in and I was “bored”. I did add an additional 10 minutes (over-mixer here). Two questions. 1. Did you use dark brown sugar? I used light. 2. The cake was a little crumbly. Was it because I sliced it before letting it cool a little or should I cut the cooking time next time? Thanks. I feel sososo fat now. This is outstanding! Thank you for a keeper recipe. We have a egg allergy in our house! What can we use as a replacement?? I’d love to make this for my family! Also would soy milk work as a replacement of milk? I haven’t made this without the egg or using soy milk, but found a link that might be helpful for the egg allergy..http://health.howstuffworks.com/diseases-conditions/allergies/food-allergy/dairy-eggs-meat/substitute-for-eggs.htm. As for the soy, you could always test it out. I’d love to know how it turns out!! Hope this helps! Made your cinnamon bun cake and my family loved it. Im not a good cook but your recipe was easy to follow and tastes great. First time ive made a desert from scratch. Usually just buy a box of something. Thank you very much. Oh, I’m so glad!! I’m sure you could make a lot more than you think!! Thanks for letting me know! Hi. I just made this cake and was wondering if it’s supposed to be light and airy or dense because I just made this and it was dense and a little on the dry side. Do you have any ideas as to what I may have done wrong? I’ve been cooking for 30 years but am just a recipe follower. Wow!!!! Just threw this together and it came out perfect. I accidentally melted the butter for the cinnamon part, and it still came out perfect. It’s almost gone. Thanks for the recipe! LOL!! We love this recipe!! I’m glad you liked it!! Thanks for letting me know! I’m attempting this today. You might Want to add powdered sugar to the ingredient list if it’s not there I almost didn’t buy any and then decided to read recipe too nonjudt the ingredient list when I was in the store. Thanks for sharing. Glad you saw it. I’ll have to maybe add the glaze recipe at the top. Thanks so much and hope you enjoy!! I have made this before…it is awesome….guys at work want more more more…can’t go wrong..Thank-you..
Haha…i bet!! Thanks so much for letting me know! That makes me happy to hear! I wonder on the Cinnamon Roll Cake recipe how to adjust the baking time or even temperature to do loaf pans or smaller cakes for gift giving?? Any advice? I haven’t tried making this in smaller pans, so I don’t know an exact amount. I’m guessing the temp would stay the same, as long as they are the same type of pan as your 9×13 and I would say that they’ll cook a little longer, since it is in smaller pans. I would just keep checking once you’ve hit that 32 minutes and add a couple every time? I’m sorry, I wish I knew better. Let me know how long they end up baking for and we’ll pass that along. Thanks!! 3 cups for the cake and 2 tablespoons for the topping 🙂 Enjoy!! I’m not sure what exactly you are wanting to know? So glad you liked it 🙂 Thank you so much for letting me know! Looks so good definitely making this! It is!! Let me know what you think. Thank you!! I’d love to know if anyone has tried with GF flour… I’m new to that kind of baking. I haven’t 🙁 But, I hope you find someone who has! That’s great! I’m glad you liked it 🙂 Thank you! I am sure it would, though I have not tried myself, since the glaze gives it a nice touch. Cream cheese frosting is an added bonus! Hope you like it! I’ve made this cake TONS of times, and I absolutely love it. I have one issue, though. Every time I make it, the cinnamon mixture seems to transfer from the top of the batter to the bottom. The cake still has amazing flavor, but if you want any cinnamon taste you have to scrape the bottom of the dish pretty good. It does sink and kind of goes throughout the whole cake, but some should be on top. I’m not sure why it would all sink to the bottom. I’m glad you like it though! I wish I could answer your problem! I made the Cinnamon Roll cake this morning and decided, with gusto, IT’S A KEEPER! Yay!! I love to hear that! Thank you! It’s one of our favs! I would love to get more recipes and ideas. Well I forgot to put the ingredient that is so important it is in the title! You guessed it, I forgot the cinnamon! I enriched the glaze with cinnamon and maple syrup on a desperate attempt to give it more flavor! It came out great , a bit bready but super soft with a crispy top. Amazing cake Kristyn , thanks you! I will be making it again! LOL..oh, no! Thank you so much for trying it & hopefully, it will taste even better next time! LOVE IT! I made it last night for my office today, and it was a smash. The only thing I did differently was I added Cream Cheese to my icing…….Awesome! I will totally make this again. Love to hear that! I am so glad it was a hit! Adding cream cheese is a great idea! Do you think I could make these as cupcakes? I want to be able to share this at school and I feel it may be easier to share, but I don’t know if that will mess with the cake. Honestly, I haven’t tried. I’m not quite sure how those would work. You could always double the recipe, make the cake & pour the other half in cupcake liners, to see how’d they turn out?? I’d love to know! Good luck! I thoroughly enjoyed making the cake and it turned out well for my first time. I didn’t get the swirl right. I made dinner for some students that I advise. I hope to make it again and get the swirl right this time. Thank you for giving it a try!! You’ll get it right 🙂 Mine wasn’t perfect the first time & it usually comes out different every time. I made this over the weekend. It is truly amazing. I should have swirled the filling in better to reach the bottom, but it was stil great. I did not have any vegetable oil so I used all butter…extra delicious!! Eat it warm. Still good cool, but better warm. I am so glad you enjoyed it! Thank you for trying it & letting me know! This looks wonderful! What is the best way to make in advance and reheat without drying it out? I thought about making just the cake part and heating it up on low in the oven and also adding the topping just before serving. Would this work? Thanks. That should work 🙂 It doesn’t have to be served warm. When I make it for functions, I will make the morning of, cover, then serve later. But, really it’s up to you. That makes me so happy to hear! It is always a hit! I am so glad you tried it! Thank you for letting me know! I have my little boy’s 2nd birthday this sunday and want to move away from traditional birthday cake. Want to make brownie muffins, and something cinnamonny. Do you think your cinnamon roll cake will work if I make it in the shape of cupcakes? I’m sure I’ll need to adjust the bake time? I’m going to give it a try… Holding thumbs it’s going to work! If by any chance you see this before saturday, please give me some tips. How did they turn out? I hope they were good! I haven’t tried these as cupcakes, so I’d love to know! It was quite an adventure… the paper cupcake cups made it hard to swirl the cinnamon mix in properly so it bubbled out while baking – causing a lot of smoke. LOL. After that the papers were stuck to the cake and I let them sit overnight and managed to remove the paper cups the following day. Apart from that they tasted great! Next time I won’t use paper cups! Well, I guess we know now 🙂 Thank you so much for letting me know! Glad everyone loved them! I have made this recipe for years now and we love it so much! Everyone I’ve given it to loves it as well. However, I came back to this recipe today and I can’t seem to find the flour measurement in the cake recipe! Did it just disappear? Is it just me?! Is it 3 cups? You’d think I’d have it memorized by now, I’ve made it so often. I’m going to just guess and use 3 cups and hope it’s the correct amount! This was very easy to prepare but the glaze is more like a buttercream or a icing texture. I followed the direction and I just want to know if it’s supposed to never like that. It’s supposed to be more like a glaze, not thick. I would add more milk until it’s the right consistency. Hope that helps! Mexican chicken and corn soup sounds simply delish. Can’t wait to try on a cool fall evening. Thanks!! They definitely are a cool night! I will 🙂 I’d love to know what you think, if you give it a try! Delicious and loved by all! Makes me so happy to hear!! Thank you for trying them & letting me know! Very delicious! Easy to makE! It was perfect! I wanted cinnamon rolls but didn’t feel like spending the time to make them. This is a great option! I am glad you liked it! This cake was divine! Everyone loved it. It was a mix between a streusel cakE and a cinnamon roll but way easier than all the rolling out anx waiting for them to rise. I coukd eat this everyday! I agree..way easier, but just as good! Thank you so much! Are we able to use self rising flour? I love this Easy recipe and the kids love it too. I have made this a few times Since it comes together so qUickly. It is so nice Served warm with a tall glass of milk. It was an Easy, sweet addition to our christmas brunch spread. I had a craving for something Sweet and warm lAst Night and whipped this up and enjoyed a little with my family before bedtime. I just shared the recipe with my friend and figured i would stop and rate/review the recipe since i use it often enough. Thank you! I appreciate that!! Thank you so much for sharing this recipe 🙂 I am so glad you like it, as much as we do! thank you so much for this delicious recipe. Cooked in glass pirex 9×13 cake dish for 33 minutes @ 350 in regular oven not convection, used margarine instead of butter because it’s what I had & it still turned out awesome! Yay!! Glad you liked it 🙂 Thank you for letting me know & for trying it! This combines two of my favorite desserts into one- soooo yummy! WOW!!! THis cake is AMAZING. SO GOOD, BEST EATEN WARM BUT WARMS UP WELL THE NEXT DAY TOO. A KEEPER FOR SURE. THANKS! Glad it’s a keeper!! Thank you so much!! Amazing – KIDDOS & HUsbanh love this incredIble cake!!! Will be baking this one often! Thank you gor sharing! Yummy! You are so welcome!! I am glad they all like it! Thank you so much for letting me know!